Please join us for the 2018 Health Care Industry Summit! 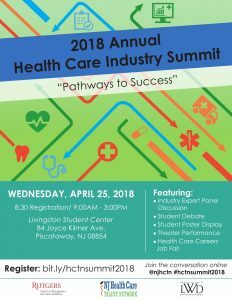 The New Jersey Health Care Talent Network (NJHCTN) in partnership with New Jersey Department of Labor and Workforce Development, Rutgers School of Management and Labor Relations, and partners from the state’s leading healthcare organizations, invite you to participate in the 2018 Health Care Industry Summit. The goal of Health Care Industry Summit is to highlight the benefits and opportunities for employment and training in New Jersey’s growing health care industry. In addition, the New Jersey Health Care Talent Network (NJ HCTN) and our partners will provide insight and information on the healthcare industry with a specific focus on educational pathways. The summit will feature a keynote speaker, an industry-expert panel discussion, student debate, student poster displays and a job fair. Participation in Industry Summit event is free! Kindly register no later than Monday, April 16th.